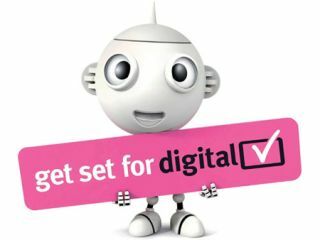 Are you ready for digital TV switchover on April 4th? | What Hi-Fi? Are you ready for digital TV switchover on April 4th? It seems to have been a long time coming, but if you live in London, are you ready for the final phase of digital TV switchover on April 4th? That's today folks! Most regions in the UK have already made the switch, with London going all-digital from tomorrow. That's the day the analogue BBC Two signal will be switched off in the capital. All the remaining analogue channels will be switched off for good on April 18th. To mark the occasion there'll be a spectacular lightshow at Crystal Palace. So if you've still got an old analogue telly hanging about in the kitchen or bedroom, it's time to upgrade or buy a Freeview/Freesat set-top box. You can check out our reviews of Freeview set-top boxes or Freesat models here on whathifi.com. If you subscribe to Sky or Virgin TV, then of course you won't have to worry. But remember, if you already have a Freeview TV or set-top box, you may still need to re-tune it. The final regions to make the switch to digital TV will be Tyne Tees on September 12th, and Northern Ireland on October 10th. Full details are on the Digital UK website.